The following are excerpts from an interview with the Scheuer family whose daughter, Sandy was killed at Kent State on May 4, 1970. "After ten years I sill think the major responsibility for the shooting is on Governor Rhodes." remarked Sarah Scheuer. "He was using the entire event for political purposes and President White should have exercised his authority and closed the school down." both Mrs. Scheuer and her husband are skeptical that the truth about how their daughter died will ever be brought to light. 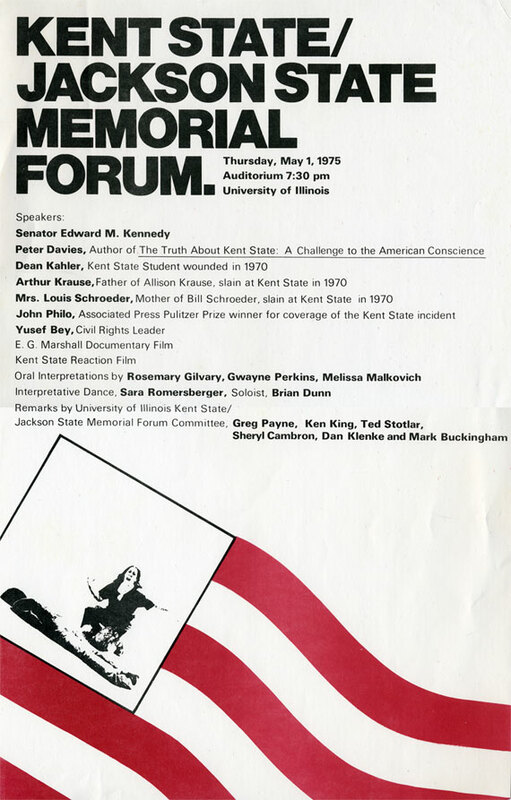 The idea of seeing Kent State on television leaves them apprehensive, yet hopeful. In the words of Martin Scheuer: "If it helps get at the cover-up, especially as it is revealed in the latest FBI information then the television program will serve a purpose. But if it just makes it look like an accident, then the truth is not served." Both Mr. and Mrs. Scheuer indicated that they could not bear to watch that portion of the television drama which depicts how their daughter, Sandy, an honors student in speech therapy, met her death on that warm day in 1970. "My daughter was a special person who was not involved in any of the demonstrations, yet in the press she was called a communist. We left Germany to guarantee that our daughters could live in a country with freedom. It doesn't make sense now ten years later. The pain will always be there," lamented Mr. Scheuer. I have some advice to all the parents of college students," Mrs. Scheuer added, "listen to your kids and remember what happened at Kent State. Since our Sandy died there have been changes in the rules on soldiers and guns on campus. That doesn't make it hurt any less, but hopefully it means Kent States won't happen again." The following is an excerpt from a letter to J. Gregory Payne from Sarah Scheuer, the mother of Sandy Scheuer, killed at Kent State on May 4, 1970.
. . .The letter written by Bruce Burkland was published in the Youngstown Vindicator's Editorial section a few weeks after Sandy was killed. Bruce was a very dear friend of Sandy's and grew up with her. It so happened that his father passed away last week, and he was here from Washington D.C. for the funeral. At the time that you called, he and his family were visiting us. Marty Levick, a boy Sandy met at Kent, was from Erie, Pa. We was a very good friend of hers and she brought him home several times, as she used to say, "for a good meal." He took the last picture of Sandy on Sunday, May 3rd. She was looking at the burned out R.O.T.C. building, holding a piece of ribbon for a leash, attached to the stray dog the girls adopted, because it was going to have puppies. On that Saturday, May 2, she asked me to take the dog home, as the end of the term was around the corner and where was the dog and her puppies to go. It was such a bedraggled thing, and what would I do with the puppies, and besides we already had one dog. Later I was sorry, that I refused the request, as the girls said that in all the excitement of May 4, the dig disappeared. Sandy felt sorry for any stray animal or lonesome person and had compassion for everyone. Now as for Marty Levick, his picture of Sandy with the dog was published in Time and a short time later sent me this beautiful letter, which I will always cherish. You can have both letters, as they are copies. When my mother and I dropped Sandy after lunch, (May 2), the lilacs in the back yard were blooming. She loved them so and said that she wished that she could bring them all inside the house. Those were the last words that I was to hear Sandy speak. I cannot look at lilacs without feeling a pain in my heart. . . . . The following is a letter to Youngstown Vindicator from Bruce Burkland, Delta Upsilon Fraternity, Ohio University, Athens, Ohio (a few weeks after the Kent State shooting). Not a Reactionary-Recalls Sandy as "Beautiful"
At this moment I am quite confused, crushed and feel that my whole world has been snatched away from me by the bullet of a National Guardsman's rifle. Sandy Scheuer, one of the four students shot at Kent State, and I had been going together for five years and I loved her dearly. Her parents are like a second set of parents to me and I mourn for them, also. It is most difficult for me to write this letter at this time, but I feel that I must because there is something that I want the people of my community to know about Sandy. To begin to describe what a beautiful person Sandy was would take forever, but there is one thing I want people to know about her which is that Sandy was not a reactionary student and was not involved in the demonstrations at Kent State. Sandy was not the type to cause or incite such events., but rather she always spread joy, happiness and laugher in people's hearts wherever she went. She was the ultimate of life, especially of my life. At the time this most unfortunate incident happened, Sandy was walking with one of her speech and hearing therapy students accross the green. Neither Sandy nor the young man had anything to do with the assembly of students on the green, but yet, as an innocent passerby, Sandy was the victim of a confused National Guardsman's rifle. The funeral is over, I have cried until I can cry no more, but the pain and sorrow are still wrapped inside of me because of the fruitless death of the girl I loved. I keep asking myself why, but that question can never be answered. Sandy will never die in my heart and I will go on living the way she would want me to, but, God knows, I don't want the world to think she was a reactionary student and incited the riots, because Sandy wasn't this type of person and would never do such a thing. She felt the same way about the world situation as most of us do today and couldn't understand why there couldn't be happiness and joy throughout the world. The wound has set in and will in time heal, but the scar that came from that wound will always remain. Those of us who knew Sandy will treasure the times we had with her and those who did not know her, please do no correlate her mane with dissent and riot because this was not Sandy. Pray for Sandy's parents and loved ones that they may have strength at this time, but also pray to God that such a senseless and shocking event will never happen again. Please, for Sandy's sake! The following is a statement by Marty Levick. Her long graceful stride had moved her in the exact rhythmic harmony of the pulsating beat of her life. She was alive and overwhelmed by the greatness of her existence. She had a quiet grace that penetrated even the hardest core and caused a smile from everyone she encountered. she was unique as an individual, her beautiful dark hair framed her angelic face with an aura of innocence. Yet she had experienced much in her long twenty years of being. She was developing into a woman of quiet joy and peaceful acceptance. This is Sandy, a friend I will always remember and cherish till my life no longer is. She was an extremely kind person always willing to help anyone in trouble. She was a perfect listener, her advice greatly respected. Sandy had strict moral oppinions usually leaning toward a disapproving negative approach. She was loved tenderly by her family and friends, always assured a place to return to filled with warmth and happiness. Sandy and I enjoyed the pleasure of a child's world. We loved to laugh, to find pleasure in every small incident of living. I feel useless without Sandy's comforting presence. When I cry she is there. When I live, love, and die she will be with me to experience every minute. Sandy was my friend. I am a very fortunate boy.